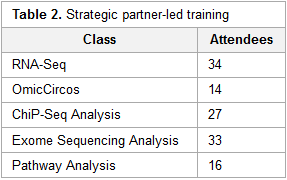 This brief case study by the National Institutes of Health's (NIH) Nathan Hosburgh takes an inside look at how the NIH took on the responsibility of bioinformatics training after the National Center for Biotechnology Information (NCBI) had to scale back its training efforts. Hosburgh provides a little background on bioinformatics and its inherent challenges. Then he delves into how the NIH—with significant help from Dr. Medha Bhagwat and Dr. Lynn Young—approached the daunting task of filling the education gap on bioinformatics, with the hope of providing "a dynamic and valuable suite of bioinformatics services to NIH and the larger medical research community well into the future."